Jeff completed his undergrad degree in Construction Technology Engineering (a management degree for construction sites) and worked in this field for approximately five years before going to Chicago for seminary at Moody Bible Institute. 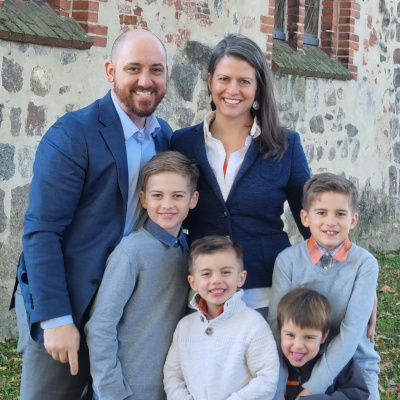 Jeff met his wife, Kristen, while in school, but soon felt a desire for further training in expository preaching and expository counseling (biblical counseling). The Millers moved to California where Jeff completed his MABC (The Master's University) and M.Div. (The Master’s Seminary). Jeff is ACBC certified as a biblical counselor and enjoys being involved in the MABC program at the university in Germany, as the director of the program and as an adjunct professor. Kristen was a Labor & Delivery R.N. until the Millers' son, Dietrich, was born, and she now serves as a homemaker. Kristen loves to teach the boys and has a strong desire to disciple and counsel gals in the Word of God. To proclaim the Word of God—publicly and privately (from house to house, Acts 20:20)—with the hope of strengthening the church through preaching, counseling, and training ministries. Jeff plans to serve as an elder and help shepherd the flock as well as teach in the TMAI training center to train leaders in Germany. Additionally, Jeff plans to work closely with ACBC (Association of Certified Biblical Counselors) to help train and certify Biblical Counselors in Europe. To make Christ known among the people of Germany through faithfully preaching and teaching the Word of God. To lovingly and compassionately help shepherd a local church. To train Christian leaders for pastoral ministry—for accuracy in handling the Word of God in preaching and counseling. To organize conferences, seminars, and classes that would promote a high view of Scripture and bring like-minded people together to continue to encourage a high view of God. To provide sound biblical counseling resources through translation and writing. For God's Word to be revered within the church and Christ lifted high through preaching, discipleship & counseling, and training (that all might worship Him). For the church to be strengthened and unified upon God's sufficient Word. For the body of believers to be built up through God's Word—living out the “one anothers” in Scripture. For evangelistic opportunities, salvation commitments, as well as growth in the maturity of those already active in the church. For the church to be a beacon of light within the Post-Christianity culture so prevalent throughout Europe. Credit Card Giving. Make a one-time or recurring credit card donation to us by filling out the form at the bottom of this page. The amount selected will be automatically withdrawn from your account once a month. Monthly Direct Deposit. To set up a monthly direct deposit, print this form and follow its instructions (use the missionary project "Miller Family - Germany"). Give via Check. To give by check, send a check payable to "GMI" and write "Miller Family - Germany" on the memo line. Send the check to: GMI at 13248 Roscoe Blvd. Sun Valley, CA 91352.